It is hardly surprising that the regional party has once again resumed its alliance with the BJP. From its inception in 1985, there are numerous instances when the Asom Gana Parishad (AGP) compromised the interests of the region. Every time, people responded with an initial sense of disbelief – followed by forgiveness and compassion. Following the developments around the Citizenship Amendment Bill 2016, the AGP had claimed to disassociate from the ruling BJP. The nature of the break, however, was merely de facto as the resignation of its ministers was never accepted. It is, therefore, hardly surprising that the regional party has once again resumed its alliance with the BJP. Despite the typicality of such behaviour, civil society in Assam once again displayed its habitual sequence of emotions. The recurrence of this sequence arises from a sense of hope that the people of Assam bestow upon the AGP despite its chauvinistic underpinnings. Hopefulness functions to block the political dialectic in Assam. It explains our collective inability to move beyond the AGP and its identity politics. The hope is embedded in a sense of nostalgia. The youth played a leading role in the Assam Movement. The AGP reflects the culmination of an extraordinary phase of struggle and embodies the memories of a generation. Many of these former students are now part of the civil society elite that emerged in the period following the agitation. They occupy senior positions in academia, media and the bureaucracy, which allows them to shape the local political discourse. It is, therefore, a small section of the citizenry – led by this elite group– that continues to be nostalgic about the AGP and precludes alternative political imaginations. However, nostalgia cannot justify exclusion – an everyday experience for the so-called ‘Bangaldeshi’ in contemporary Assam, which is largely fuelled by this elite section. Thus, nostalgia works as a deterrent to giving up their hope and support for the AGP. Abandoning it could be seen as disloyalty and one may subsequently feel lonely, after dedicating so much to the movement – even if its leaders now seek the comfort of communal forces. Forsaking the AGP would amount to losing a reference point in life. The ease with which the party has renewed its association with the BJP discreetly points to a certain degree of political impunity enjoyed by it – more so as the decision has come after the BJP formally stated its intention to introduce the Citizenship Amendment Bill again, if returned to power. What social constituency does the AGP represent? This question is important due to the presumption that the perceived instrumental value of the alliance would outweigh the electoral base that the AGP would alienate by moving contrary to a perceived regional interest. During the Assam Movement, many of the feeder organisations of the AGP – like the All Assam Students’ Union (AASU) and Asom Jatiyatabadi Yuba Chatra Parishad (AJYCP) – proved instrumental in politicising the social constituency on caste Hindu lines by offsetting various tribal and class mobilisations. The ascendance of the BJP in contemporary Assam, therefore, reflects the shifting preference of its social constituency towards a political order that could better facilitate its caste Hindu interests. This renegotiated social contract between the caste Hindu Assamese and the BJP has consequently ‘pulled the (social) rug’ out from under the AGP. In 2009, when the BJP and AGP contested the general elections in an alliance, the parties secured 16.21% and 14.6% of the vote share, respectively. In 2014, when they contested separately, the BJP continued to expand its vote share to 36.8% while the AGP plummeted to 3.8%. Therefore, unlike what is being perceived by a section of the intelligentsia and media, the AGP is not alienating much by re-entering the saffron fold. Instead, the alliance would afford a new opportunity to the AGP for re-affirming its caste Hindu electoral base. By resuming its ties with the BJP, the AGP has shifted the trajectory of regionalism in Assam. In politics, regionalism could function as an ‘ideology’ as well as an ‘instrumentality’. 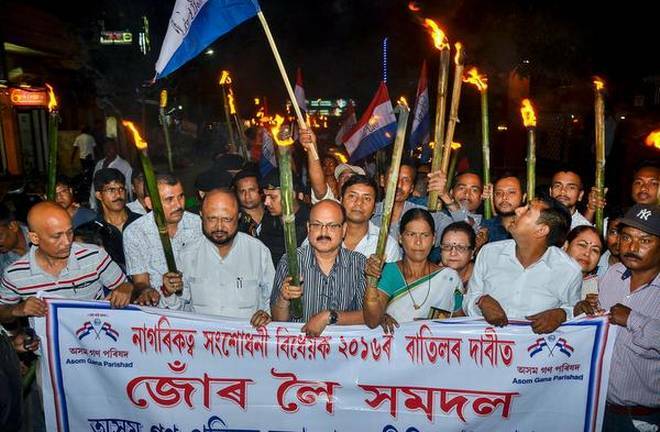 The politics of earlier regional formations in Assam – like the Jatiya Mahasabha, Purbanchaliya Lok Parishad and Asom Jatiyatabadi Dal – accorded a salience to the region that preceded political imperatives. The AGP embodies a departure towards a form of politics where the region becomes just another category for negotiating and distributing political resources. Such an instrumentality could make regional parties like the AGP immune to the vicissitudes of ideological compulsions. This broadens their terms of negotiation by allowing them to strategically articulate their marginality. Thus, by realigning with the BJP, the AGP has secured regional politics in Assam by placing it upon a more sustainable political logic. The shift of the party has created a void in terms of the ideological appeal of regionalism. When there is such huge discontent with the BJP due to issues like the Citizenship Amendment Bill, who will fill this void ? Is it the Congress? If so, does it imply that the Congress will assume a regional character in Assam and be able to emerge as the choice for voters who seek to have their voices heard? This isn’t new. We have seen a similar course before – with the organised left and the Janata Party turning to such regional concerns to hold their ground. Is this, then, a phase of reorganisation for the Congress – given the political milieu in Assam? Suraj Gogoi is a doctoral candidate in sociology at the National University of Singapore and tweets @char_chapori. Abhinav P. Borbora is a political commentator based in Guwahati.